The Client Service Coordinator ("CSC") drives the flow of clients and pets through the hospital, maximizes the productivity of the veterinary medical team (in terms of numbers of clients and pets), ensures good communication with associates and clients, and coordinates the care of clients and pets in a happy, welcoming, friendly and efficient manner, influencing clients to return and refer their friends and families. Live and exemplify the Five Principles of Mars, Inc. within self and team. Actively recruit new clients by promoting hospital services and route the flow of clients and pets to ensure superior client care and maximum productivity of the veterinary medical team. Maximize the number of pets seen by the hospital team through through a productive and efficiently run hospital to support the needs of our wellness plan clients. Provide professional, efficient and exceptional service at all times. This includes encouraging hospital visits, welcoming clients and pets, ensuring that they are comfortable in the hospital, and educating them about their pet's health. Assist incoming clients by completing the required documentation, entering all pet information and history in the computer, utilizing proper collars and tags for identification, and ensuring prompt service. Assist outgoing clients by providing all necessary instructions, information and invoices, dispensing prescription items per the veterinarian's instructions, selling retail products and scheduling future appointments. Manage the finances by maintaining accurate balances and utilizing proper opening and closing procedures. Conduct administrative functions as necessary. Other job duties as assigned. Quality – The consumer is our boss, quality is our work and value for money is our goal. Responsibility – As individuals, we demand total responsibility from ourselves; as associates, we support the responsibility of others. Mutuality – A mutual benefit is a shared benefit; a shared benefit will endure. Efficiency – We use resources to the full, waste nothing and do only what we can do best. Freedom – We need freedom to shape our future; we need profit to remain free. Ability to multi-task- Manages multiple tasks at one time; quickly and accurately shifts attention among multiple tasks under distracting conditions without loss of accuracy or appearance of frustration. Communication skills - Reads, writes and speaks fluent English, using appropriate grammar, style and vocabulary. Correctly spells commonly used English words and job specific terms. Demonstrates exceptionally strong written and verbal communication skills. Organizational ability – Demonstrates a systematic approach in carrying out assignments. 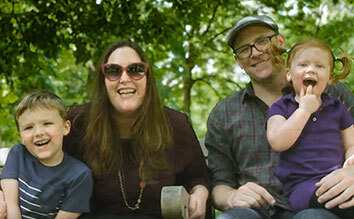 Is very orderly and excels at cutting through confusion and turning chaos into order. Problem solving skills - Demonstrates a strong ability to identify, analyze and solve problems. Translates problems into practical solutions. Client service skills - Consistently ensures the team provides the client with attentive, courteous and informative service. Gains and shows personal satisfaction from delivering great service. Intellectual ability - Accurately and consistently follows instructions delivered in an oral, written or diagram format. Can provide directions. Mathematical ability - Ability to add, subtract, multiply and divide, and to compute rate, ratio and percent; ability to convert units of measurement. Computer skills - Comfortably and confidently uses a computer and specialized software. Microsoft Word, Excel, Access, Outlook, etc. Initiative – shows willingness and aptitude to use own discretion in taking appropriate steps in finding solutions to problems; presents options and ideas to enhance current processes or procedures. Takes on additional responsibility when both big and small tasks need to be done. 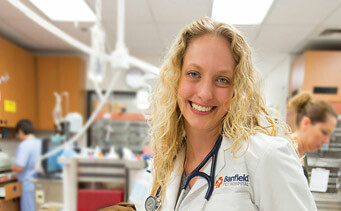 Integrity – Firmly adheres to the values and ethics of Banfield Pet Hospitals. Exhibits honesty, discretion, and sound judgment. Cooperativeness – Willing to work with others, collaborating and compromising where necessary; promptly share relevant information with others. Flexibility – Is open to changing situations and opportunities and is willing to perform all tasks assigned. Independence – Able and willing to perform tasks and duties without supervision. Tolerance for Stress / Resiliency – Maintains a positive “can do” outlook, rebounds quickly from frustrations and unpleasantness, and maintains composure and friendly demeanor while dealing with stressful situations. Ability to work at a computer for long periods of time. Client needs and work volume may often require more than 40 hours per week to complete essential duties of this job. This position requires special hours including working weekends and evenings. Must have mental processes for reasoning, remembering, mathematics and language ability (reading, writing, and speaking the English language) to perform the duties proficiently. The noise level in the work environment is moderately high. Requires sufficient ambulatory skills in order to perform duties while at hospital. Ability to stand, walk, stoop, kneel, crouch, and climb as well as manipulate (lift, carry, move) up to 50 pounds. Requires good hand-eye coordination, arm-hand-finger dexterity with the ability to grasp, and visual acuity to use a keyboard and operate equipment. 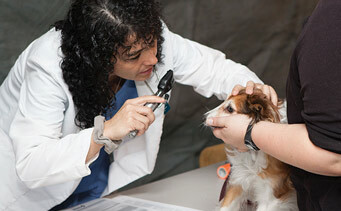 Associate is routinely exposed to a variety of pets that may bite or scratch, and on occasion, exposed to anesthesia, radiation, biological hazards and medication/controlled substances. Must be at least 18 years old to perform duties involving radiography (x-ray) and exposure to radioactive substances. One year related experience required with customer service preferred. Medical background (veterinary technician, human healthcare, pharmaceutical, etc.) with medical terminology training is preferred. WE ARE A DRUG-FREE, SMOKE-FREE, EQUAL OPPORTUNITY EMPLOYER.